Since the technology of our FSD drives has improved, exploration of deep space has been greatly changed. The time of the pioneers is over. The Galaxy has narrowed and previously difficult points of access are now within the reach of the majority, with a long-term effort and some risk-taking. Our dear leaders stay warm in the promiscuity offered by this small inhabited bubble so-called the Core Worlds. It seems to suit them, even if it’s true that they feel cramped out there, just see their policies explicitly expansionist. They have the nose in the handlebars of their scams, their manipulations, and some even hate flying in space. They therefore imagine that what they experience is great, beautiful, and the power they exercise or think they exert on our lives gives them the jubilation that one can feel during the loss of lucidity that usually accompanies psychotic access . One cannot blame them, the exercise of power demands to muffle the cries of conscience and the empathy that characterizes our species. This has always been the case, and this is even more true today, while human history has never known such extensive dominions. The puppets that are our leaders have always expressed their contempt for the community of independent explorers, and for good reason, it reminds them of how far back they lack of objectivity and the height of the vacuity of their ambitions. 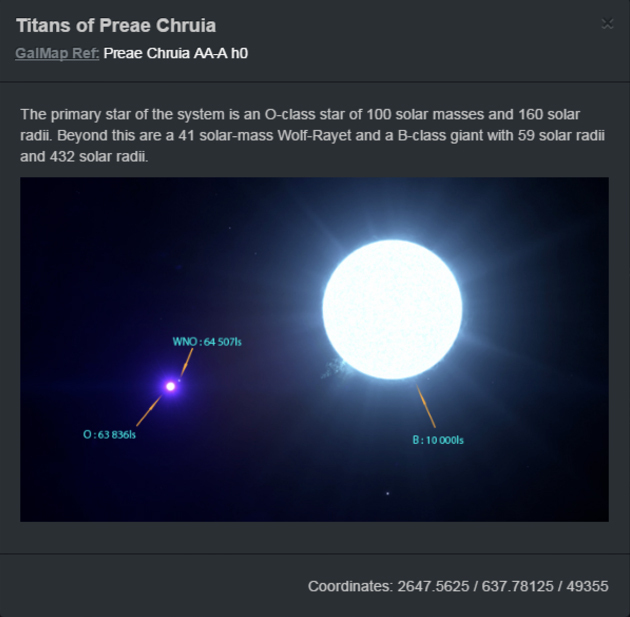 That is why we are going to give the floor to this community today, and in particular to an expedition en cours: the Summer Great Expedition, launched to join Beagle Point in the footsteps of the pioneers of the Distant Worlds expedition. Its organizer, Cmdr Kazahnn Drahnn, kindly answered our questions. The Onionhead / Piaf: Hello Cmdr Kazahnn Drahnn. Can you introduce yourself in a few words to our readers? Kazahnn Drahnn: Hello to all, so I introduce myself, I am the Cmdr Kazahnn Drahnn of the LOSP. I am in charge of an Anaconda, the “Venator”, which I optimized thanks to the engineers in grade 5 for exploration. My crew is composed of thirty mainly military personnel, even if the ship is not armed, with a scientific team to study any finds. I recently joined the Magellan division of the LOSP, which allowed me to form the Summer Great Expedition. TOP: How did you come up with such a long expedition? 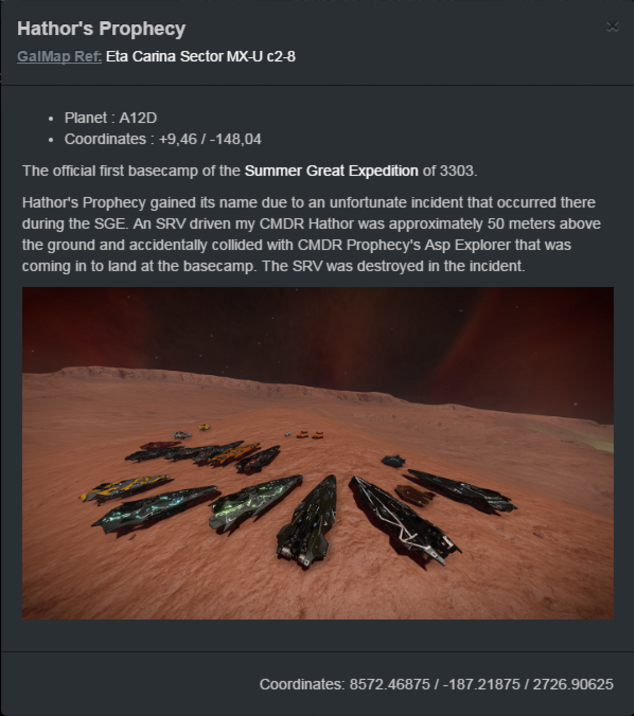 I remind you that the Summer Great Expedition is an expedition to Beagle Point. It’s not the next door. Kazahnn Drahnn: One evening in March 3303 I was in the Pleiades sector with Cmdrs Yuksarr and Kalhaan and we were looking for Cmdr Salomé. After several hours of research in the systems by crossing our data and by informing the various ships of the other factions in search of her, we decided to stop the investigations. Cmdr Kalhaan returned to Jitabos, and then Yuksarr and I went down a little further down towards 46 Eridani. We were able to discuss our future projects and one of them was common to us. The one to reach Beagle Point. That’s how the idea of bringing together a small group of explorers to reach Beagle Point came up to me. TOP: How many pilots participate? Are they all seasoned explorers? Kazahnn Drahnn: At present, the Summer Great Expedition has 79 commanders, 46 of whom are fleet A and 33 are fleet B. Some are seasoned explorers, others are novices. But from now on, as we reached Beagle Point and are en route for our return, I think we can all be qualified as seasoned explorers, if I may. However, everyone, no matter their level at the start of the expedition, learned a lot during the trip. We all stuck together in the tough times, like the day we lost our first SRV in a terrible accident at the first Waypoint in the Eta Carina Nebula. Moreover, for the small anecdote the place of the accident was referenced in the “Galactic Mapping Project” under the name of “Hathor’s Prophecy”, a mixture of the names of the two commanders involved in the catastrophy. TOP: A french-speaking expedition, but I understand that english and german-speaking were also part of the game? Kazahnn Drahnn: At first, the expedition was intended to be exclusively french-speaking, or even reserved exclusively for members of the LOSP. However, after reflection, I decided to open this one to all the members of the french-speaking community in order to make the most of this experience to many on the other side of the galaxy. Then, by publishing our expedition on the main holonet forum, several english-speaking commanders decided to take part in the tour, and it was with great pleasure that we welcomed them. Finally, since Cmdr Melbus was bilingual (french and german-speaking), he told the german community that we were going to Beagle Point and that is how we also counted among the germans. TOP : This diversity of communities around the ancient languages of our good old Earth seems to be totally ignored by our dear leaders, indeed. You mentioned a disaster, have you had any losses during the trip? Kazahnn Drahnn: Overall, the whole expedition went well. But as I mentioned above, our first loss was to be deplored at the first waypoint in the Eta Carina nebula. An accident involving an SRV and an ASP Explorer. Then we lost the Cmdr Snake (german-speaking) at the waypoint in the Rendezvous Point system, he didn’t negotiated well its descent on the planet and was destroyed instantly. 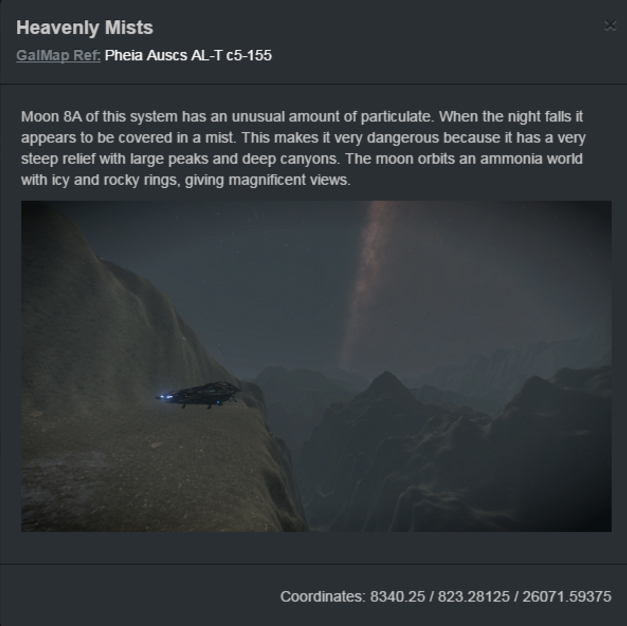 Then, Cmdr Mist0 crashed during a bad maneuver by looking for geysers or other POIs on a mysterious planet identified in the Galactic Mapping Project under the name of “Heavenly Mists” because it is very dense in mist and possessing a special relief steep, and therefore very dangerous. The Cmdr Astrix Swayer also lost its Diamondback Explorer due to technical incidents at rehearsals of a massjump. It is for Fleet A the three losses which we have had to deplore. For Fleet B, there were also a few casualties. Cmdr Penpenbf was destroyed by a pirate mod when he arrived at Sagittarius A *, unthinkable as far from the bubble but yet it is a reality. He had technical concerns that caused his loss. TOP: This kind of expedition is anything but a health walk, as all too often let the officials of various shores hear. With regard to the two convoys, why split the expedition into two convoys? Kazahnn Drahnn: Splitting the expedition into two parts came from a need of some of us, who come from the Wing Atlantis, to make another trip. Their goal was not to reach Beagle Point unlike us, but we still decided to fly under the same banner at least for the first two waypoints. We segregated the fleet in Hawking’s Gap. Their objective was to carry out a reconnaissance survey of the abandoned bases that can be found in the Hawking’s Gap and the Conflux, while passing by Sagittarius A * and Colonia. This for personal purposes. TOP: You told me, off, that the SGE was close involved in the Galactic Mapping Project? This is a project that we know very well , some of us, amoung our newsroom, have been actively involved. Can you talk to us about that? Kazahnn Drahnn: The expedition is of course a partner of the Galactic Mapping Project. In short, the LOSP has been the ally of the Children of Raxxla for a long time and we have always worked hand in hand regardless of geopolitical contexts. It was obvious to me that we were moving closer to Erimus Kamzel and the Galactic Mapping Project for such an ambitious project. The idea is to list all the peculiarities that our galaxy can contain in order to improve the navigation map of all the pilots in their future voyages within the Milky Way. TOP: Now that you have a communication platform dedicated to french-speaking explorers, you have solid foundations for future projects. Do you already have such projects? Kazahnn Drahnn: Since the Summer Expedition was a great success, we have already started to think about other expeditions / explorations more or less long. But I can not tell you more because they are “work in progress” status. TOP: Thank you so much for spending some of your time, and good flight to all the expedition. Kazahnn Drahnn: I also thank you and good news for your newspaper, which is very much appreciated by my crew and by the crews of the other ships as well. Article précédent Previous post: Breaking News : An independent scientist escapes from death !